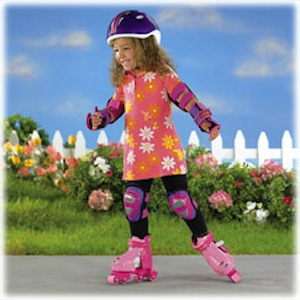 These inline-style skates help kids learn to skate, keeping pace with growing feet and growing skill. Start with setting #1 so beginners can walk in the skates with one wheel locked. As confidence and ability increase, advance to level #2, where the adjustment wheel rolls forward but not back. Then it's on to #3 for "freewheeling" fun! Rear wheels are spaced apart for added stability. Padded boot collar ensures comfort, with hook-and-loop straps for easy on and off. Size adjustable, from child's shoe sizes 6 - 12.